Two years after the final space shuttle launch, the sentimental sendoff to put the retired orbiters on public display around the country was finished Saturday with the opening of the extravagant Kennedy Space Center Visitor Complex attraction showcasing Atlantis. It's T-minus 3 weeks and counting until the grand opening of the space shuttle Atlantis attraction at the Kennedy Space Center Visitor Complex in Florida, just miles from where the orbiter was processed and launched on 33 missions. The clamshell payload bay doors of space shuttle Atlantis swung open this week at the Kennedy Space Center Visitor Complex as the retired ship is configured to mimic her flying days in orbit. The space shuttle Atlantis, now a museum piece at the Kennedy Space Center Visitor Complex, has emerged from the protective plastic cocoon that had encased the spacecraft since November. Towering replicas of the twin solid-fuel booster rockets that provided the vast majority of thrust to propel space shuttles skyward are being stacked outside the new Atlantis exhibit at the Kennedy Space Center Visitor Complex. Tourists coming to America's spaceport at the Kennedy Space Center Visitor Complex are being greeted by a modernized entrance, a facelift officially unveiled Thursday as part of the park's expansion in the coming years. It is a space shuttle orbiter like you've never seen before -- wrapped in a plastic cocoon, perched atop pedestals and tilted at a steep angle -- while construction crews finish building a massive exhibit hall around the spaceship. The space shuttle Atlantis has been encased in a protective plastic, a wrap that will keep the spacecraft dust-free while construction crews finish building the exhibit hall to showcase her to the public. This time-lapse video captures Atlantis' 9.8-mile journey from the Vehicle Assembly Building to the Kennedy Space Center Visitor Complex for retirement. Although the new $100 million facility to showcase the space shuttle Atlantis won't be finished and opened to the public until next July, tourists can get a "sneak peek" of the retired orbiter this week parked inside the exhibit hall at the Kennedy Space Center Visitor Complex. The shuttle Atlantis was hauled away from Kennedy Space Center's Complex 39 Friday, leaving the hub of space shuttle operations barren for the first time since 1979. SHUTTLE STATUS CENTER - live updates and streaming video! Looking to leave before sunup Friday, Atlantis will be hauled away from Kennedy Space Center's Complex 39 and leave the hub of space shuttle operations barren for the first time since 1979. The final moment resembling normalcy in the space shuttle era at the Kennedy Space Center occurred Wednesday morning as Atlantis rolled from her hangar to the Vehicle Assembly Building, a trek performed 35 times for real in the ship's flying days and now one last time for storage to await transfer to the spaceport's museum Nov. 2. The massive new building that has sprouted up on the Kennedy Space Center landscape to display the space shuttle Atlantis as a national treasure will receive the spacecraft Nov. 2, officials said Wednesday during a "topping off" ceremony. In the quiet, peaceful setting of a storage bay in the northwest corner of NASA's cavernous Vehicle Assembly Building at the Kennedy Space Center on Monday afternoon, Spaceflight Now photographer Walter Scriptunas II used the tranquil opportunity to shoot this gallery that captures the space shuttle Atlantis in exquisite detail. Mere minutes after the Delta 4-Heavy rocket's thunderous roar reverberated across Florida's Space Coast on its successful trek to space Friday morning, the retired space shuttle Atlantis made a brief appearance outdoors as she moved from the hangar to the Vehicle Assembly Building. Already having been powered off for the final time, the shells of rocket pods installed on her tail and nose and key components removed for future use, technicians Tuesday finished inserting replica main engines on space shuttle orbiter Atlantis for permanent display at Kennedy Space Center's Visitor Complex. The shuffling of NASA's three retired space shuttle orbiters between the two remaining hangars at the Kennedy Space Center continued Friday morning as Atlantis was moved into a two-month storage at the Vehicle Assembly Building. Check out our 5-page photo collection from the event. The final space shuttle payloads were removed from Atlantis' cargo bay Tuesday morning inside Kennedy Space Center's orbiter processing hangar. The Italian-made Raffaello logistics module and the failed ammonia coolant pump returned from the International Space Station during the July shuttle mission. Spaceflight Now had the rare opportunity to witness Tuesday's unloading operation and shoot this photo gallery. The iconic soul of America's space program for the past 30 years slipped gracefully into history on a dark runway Thursday morning as the winged spaceship Atlantis made a poignant touchdown to conclude the shuttle program. The five remarkable flying machines launched on 135 missions, traveled 542,398,878 miles that spanned 21,152 orbits of the planet, and carried 355 humans and 3.5 million pounds of payloads as the Space Transportation System. The final hours of the space shuttle program are ticking as Atlantis prepares for Thursday's predawn landing at the Kennedy Space Center. Touchdown on Runway 15 is scheduled for 5:56 a.m. EDT to conclude three decades of flight for America's Space Transportation System. The crew of the shuttle Atlantis, working through one of the busiest days of their mission, tested the orbiter's re-entry systems Wednesday and packed up for landing Thursday to close out NASA's 135th and final shuttle mission. Take a ride on the final space shuttle launch with remarkable footage captured from cameras mounted on the solid rocket boosters, external fuel tank and even inside Atlantis' cockpit looking back at the astronauts. Check out these amazing videos of the spacecraft soaring to orbit, which are presented here for Spaceflight Now+Plus users with launch audio. The final space shuttle parted company with the International Space Station on Tuesday in a sentimental sendoff for America's winged machines that spent the past decade constructing the million-pound science complex and supplying the orbiting laboratory with vast loads of logistics. In 37 missions, the shuttles spent 276 days, 11 hours and 23 minutes docked at the station. In the dwindling hours of the shuttle program's last visit to the International Space Station, the Atlantis astronauts detached the bus-size Raffaello cargo module and moved it back to the shuttle's payload bay, wrapping up NASA's final shuttle-station resupply mission. The Atlantis astronauts put in a final day of logistics transfer work Sunday, working through off-duty time to finish moving a last few items into the Raffaello multi-purpose logistics module for return to Earth. If all goes well, the cargo module will be detached from the station's forward Harmony module and mounted back in the shuttle's payload bay early Monday, setting the stage for the ship's final departure from the lab complex Tuesday morning. With a final shuttle-era spacewalk behind them, the Atlantis astronauts focused on logistics transfers Wednesday, devoting their day to moving cargo and supplies from the shuttle's crew cabin and the Raffaello multi-purpose module into the International Space Station. They also took time for maintenance work, servicing the lab's U.S. toilet and restarting the crew's urine recycling system after standing down a day to let a strong odor dissipate. International Space Station residents Mike Fossum and Ron Garan stepped outside Tuesday to lend helping hands to the space shuttle mission, packing a failed ammonia coolant pump into Atlantis' payload bay for return to Earth and unloading a satellite servicing demonstrator carried to orbit aboard the visiting spaceplane. The spacewalkers also deployed a new materials science experiment, fixed a snagged wire in one of the station's robot arm operating bases and wrapped a vacant docking port with a thermal cover. This was the lone EVA planned for Atlantis' mission, bringing the spacewalking era for the space shuttle program to conclusion. A cargo-delivery module packed with 9,400 pounds of food, equipment and science gear departed shuttle Atlantis' payload bay Monday morning and parked at the International Space Station's doorway for unloading. Meanwhile, NASA has officially added an extra day to the shuttle mission. America's final space shuttle has arrived at the International Space Station, the science laboratory it trucked piece by piece to orbit for assembly, to deliver one last massive load of goods and provisions that only the winged spaceplanes can carry. The solid rocket boosters from the space shuttle's final launch are back in port. These images show one of the spent motor casings arriving back at Port Canaveral on Sunday. The Atlantis astronauts inspected the shuttle's heat shield Saturday and fine tuned the shuttle's approach to the International Space Station, setting their sights on docking at the lab's forward port around 11:07 a.m. EDT Sunday. After a cliff-hangar countdown, the space shuttle Atlantis thundered to life and majestically rocketed into history Friday, putting on one last sky show for spectators jamming area roads and beaches to witness NASA's 135th and final shuttle launch. Atlantis' landing will come seven-and-a-half years after President George W. Bush, responding to the 2003 Columbia disaster, ordered NASA to complete the International Space Station and retire the space shuttle fleet by the end of the decade. Reliance on the former Cold War rival has been a particularly bitter pill to swallow for many at NASA, forced to retire the most sophisticated manned spacecraft ever built before a U.S. replacement is available. Atlantis is using NASA's final set of solid-fuel boosters and its last external tank, so there isn't another shuttle waiting in the wings for a quick-response rescue mission if needed. Soyuz lifeboats will be used in such a dire scenario. The day after takeoff will be particularly busy as the astronauts as they inspect the shuttle's heat shield, dock to the International Space Station and mount the Raffaello module onto the complex. While the astronauts begin unloading the cargo module, fellow station residents Ron Garan and Mike Fossum will conduct the mission's only spacewalk. Hundreds of engineers, technicians, astronauts and NASA managers will be standing by to welcome Atlantis and its crew home and to "share the moment" as the shuttle program comes to an end after three decades. Forecasters are predicting a 70 percent chance of showers and thunderstorms Friday that could delay launch of the shuttle Atlantis. But barring a dramatic change for the worse, the chairman of NASA's mission management team says he plans to press ahead with flight preparations. As we prepare to say goodbye to the space shuttle, let's take a moment to reflect on the ship that will sail the final voyage this week with a look at Atlantis' history and a special photo tribute as she stands on the launch pad one last time. Countdown clocks began ticking Tuesday for the shuttle Atlantis' launch Friday on NASA's 135th and final shuttle mission, a flight to deliver more than 8,000 pounds of supplies and equipment to the International Space Station. This was it. The last time a space shuttle crew will jet into the Kennedy Space Center to begin their countdown. And no one knows when the next time astronauts will come to the Florida spaceport to be launched from the planet. Fergie, Chunky, Sandy and Rex. You can call them "the final four." They are the astronauts chosen to launch Atlantis into orbit Friday for the space shuttle program's grand finale. The 60-foot-long payload bay doors of space shuttle Atlantis were swung shut and latched for flight at pad 39A Wednesday. The next time the doors will be opened is in orbit, about 90 minutes after launch. Senior NASA officials held the final space shuttle flight readiness review at the Kennedy Space Center today and affirmed plans to launch Atlantis next week as scheduled. The six-member crew of the International Space Station was told to seek shelter in two Russian Soyuz spacecraft Tuesday because of a predicted close pass by an unknown piece of space debris. But the time of closest approach came and went harmlessly at 8:08 a.m. EDT. Thursday morning was a practice launch day at the Kennedy Space Center for the shuttle Atlantis, her four-person astronaut crew and the various ground teams supporting the spacecraft's ascent to orbit. Engineers carrying out X-ray inspections of rib-like "stringers" in the shuttle Atlantis' external tank are running ahead of schedule and so far, officials said Wednesday, there are no signs of any temperature-induced cracks in the wake of a fueling test last week. Working in parallel, another team has replaced a leaking hydrogen valve in main engine No. 3. Space shuttle Atlantis' astronauts Tuesday took turns test-driving an armored tank around Complex 39 as part of their emergency training exercises. The tank would be used by the crew to escape the pad 39A bunker in a dire scenario during the countdown. The four astronauts to fly Atlantis on the final space shuttle voyage have jetted into the Kennedy Space Center for this week's countdown dress rehearsal and emergency training drills. A cargo-laden module stuffed with a full year's worth of necessities for the International Space Station was loaded into shuttle Atlantis' payload bay Monday to prepare for launch next month. A hydrogen fuel valve in one of the shuttle Atlantis' three main engines that appeared to leak during an external tank fueling test Wednesday will be replaced next week in parallel with work to X-ray structural stiffeners in the tank's central compartment, officials said Thursday. The valve replacement work is not expected to impact Atlantis' July 8 target launch date. Engineers pumped a half-million gallons of supercold rocket fuel into the shuttle Atlantis' external tank Wednesday to verify the integrity of structural stiffeners intended to prevent cracks during the countdown and climb to space July 8. During the operation, however, the launch team detected indications of a possible leak on engine No. 3's main fuel valve. Hours after Atlantis was parked at pad 39A, Spaceflight Now received rare access to the shuttle launch complex as the sun rose over the Atlantic Ocean. These spectacular photos show the spaceship from all angles as it's readied for the last space shuttle launch in July. Swooping out of the nighttime sky to enter homeport a final time, the shuttle Endeavour has safely completed her spaceflight career that covered 25 voyages to Earth orbit over 19 years, spanning 122,883,151 miles traveled, 4,677 revolutions of the planet and 299 days aloft. While space shuttle Endeavour was completing her final orbits of the planet, sistership Atlantis traveled to Kennedy Space Center's launch pad 39A late Tuesday. Rollout got underway at about 8:42 p.m. and was completed at 3:29 a.m. EDT. For the final time in space shuttle program history, an orbiter was hoisted from the floor of the Vehicle Assembly Building and bolted to an external tank and solid rocket boosters. Final mating was completed early Thursday. 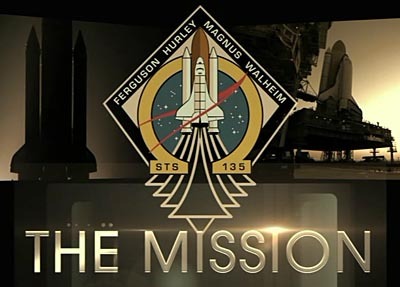 MISSION STATUS CENTER - live video coverage! Tuesday was moving day for Atlantis as the space shuttle traveled from the Orbiter Processing Facility bay No. 1 to the Vehicle Assembly Building in preparation for the final space shuttle mission. The U.S. government budget approved last week all but validates NASA's hope to fly the shuttle Atlantis on a much-needed bonus mission as soon as June 28, according to agency officials. The past week saw the upper solid-fuel motor segments attached and the nose caps set in place atop the final space shuttle rocket boosters, completing the last buildup in the program's three-decade history. The powerful booster rockets for the final space shuttle launch continue to be stacked segment-by-segment inside the Vehicle Assembly Building in preparation to propel Atlantis skyward this summer. The space shuttle Atlantis astronauts visited Kennedy Space Center on Thursday and Friday for up-close and personal interaction with the orbiter and the payloads being readied for flight this summer. The last-ever set of space shuttle solid-fuel rockets began taking shape Tuesday evening as technicians started stacking the boosters that will power Atlantis this summer. Space shuttle ground technicians at the Kennedy Space Center have achieved yet another "final" milestone on the road to the program's looming retirement: installing the last set of main engines. Awaiting word on whether one additional shuttle flight will be approved by Congress and the Obama administration, NASA managers are protectively considering June 28, 2011, for launch of shuttle Atlantis on a rescue mission if a major problem threatens the crew of the final planned shuttle flight in late February. If not, and if NASA gets the required funding, the agency would launch Atlantis on an actual space station resupply mission to close out the shuttle program. Space shuttle Atlantis safely returned to the homeport Wednesday after the final planned voyage in its quarter-century of spaceflight. The vehicle's rich history included 294 days in space, 4,648 orbits of the planet and 120 million miles traveled during 32 flights. Whether NASA gives Atlantis one more mission next year remains unknown, meaning this landing could have been the orbiter's last before retirement. A key NASA supporter in Congress is beginning a formal push for an extra space shuttle flight, as NASA officials prepare to present options to top Obama administration officials next month. Whether it was launching satellites to orbit our planet and even other worlds, breathing new life into humanity's telescope, fostering international relationships or building a laboratory in the sky, the space shuttle Atlantis has been a workhorse for mankind over the past 25 years. Does shuttle Atlantis have one extra flight in her? Could space shuttle Atlantis get a reprieve from retirement and fly again next year to truck a load of supplies to the International Space Station?